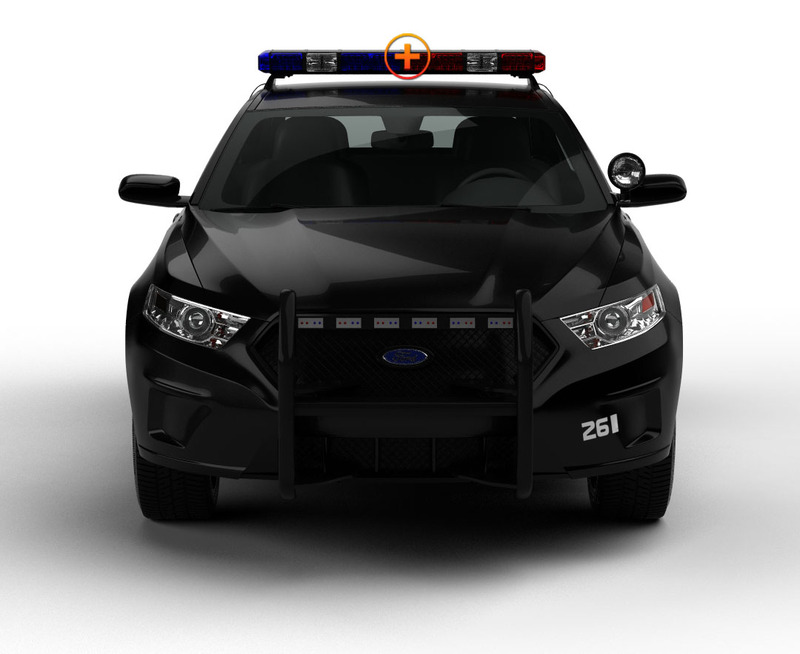 The 20” Mirage Mini has 114 Watts of high-energy, brilliant light shining in a 360° range because it has 4 modules on the front and 4 on the back of the light bar, each with 4 Generation IV 3-Watt LEDs. Add 6 more watts from the 3 LEDs on each end, and you have a power light bar that can be seen up to a mile away. It stands just 3” high on 4 legs, each with a 40# magnet to hold it securely in place. 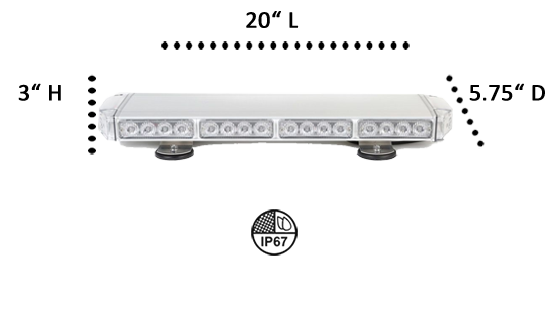 * The light bar is powered by a cigarette lighter plug-in that has an ON/OFF Switch and a Flash Pattern Switch that operates the 15 flash patterns. It comes with a 12’ power cord, so attaching it to any flat surface of your emergency unit is quick and easy. The industrial grade aluminum light is sealed with epoxy making it 100% waterproof. The Mirage Series comes with TIR lenses that produce controlled beams that illuminate the targeted area; the ‘targeted area’ for the Mirage Series is a beacon of light that completely encircles your vehicle and shines brightly in all directions. You choose the color lights that’s best for your job from 3 solid colors or 4 split-color combinations. The actual height of the light bars of the Mirage Series is just 1.8” making it one of the thinnest light bars on the market! For such a small size, it produces an amazing amount of light on 12V, but don’t worry it has low amperage and won’t drain your battery. The 20” is the perfect Quick Set-Up Light! You are well seen and safe in an instant because you get all the brightness you need...and MORE..by just plugging it in and mounting it high. This mini light bar is NOT Rated for highway speeds with a magnetic mount install. DO NOT Attempt to drive this vehicle without having this light bar permanently hard mounted to your vehicle. No better mini light bar for the money. I was impressed on how bright the LED's are, even during the day. At night the lights pierce the darkness and they see you coming. Quality heavy duty construction and great warranty. To be honest, I'm floored! The quality, effectiveness, operational options and price combine to produce a unit that beats all others of similar size on the entire market! There are mini-lightbars from big name makers who do not make a product of this quality and with these options for anything near the price sold here on ETD! I couldn't wait to try it out, and in the daylight it is extremely bright. Great little light does everything you wanted and then some would buy again . Great light ,easy to install ,bright and affordable. I buy this Mirage 20 about one year ago.Still bright, easy to install and the best is I do private security and I drive my truck speed limit 65mph and no move.The magnet is awesome.I recommend you. An awesome light... Day or night, good and bright, nice pattern. It's a great lite for the price !! Just got my new light in the mail. Tried it in daylight and very bright. Tried it at night and wow very powerful and bright. Would recommend this for any firefighter to use on truck. The magnets are powerful and will not blow off your roof. No better mini light bar for the money. I was impressed on how bright the LED's are, even during the day. At night the lights pierce the darkness and they see you coming. Quality heavy duty construction and great warranty. Great little light does everything you wanted and then some would buy again . To be honest, I'm floored! The quality, effectiveness, operational options and price combine to produce a unit that beats all others of similar size on the entire market! There are mini-lightbars from big name makers who do not make a product of this quality and with these options for anything near the price sold here on ETD! I couldn't wait to try it out, and in the daylight it is extremely bright. I can't wait to try it in the evening - it will probably blind me! I've been an EMT since I was 16 years old, and have always been interested in emergency lighting equipment. I have lights from Whelen, Federal and other makers, and for the money, none compare to this unit. Thanks ETD for making such quality and effectiveness affordable to us, the non-rich volunteers! Great for the price, Great at night and daytime!! I just received my light bar to day in the mail. It's extremely bright during the day. Haven't had a chance to see it at night yet. I love the last memory feature also. Great light for a great price. I'll edit this review upon seeing it at night time.